Nothing says spring like…Janice’s art class program! Bring your kids to these enlightening sessions in the warm and welcoming ambiance of the Hilltop, Saturdays from 10:30-noon. Drop off your kids or stay and view our current Gallery show, peruse our library and enjoy our patio views. Light refreshment for participants after, plus a FREE apron for the first 10 “artists”! This month we hosted classes and student exhibit for the participants in the Santa Cruz Parent Love Connection (SCPLC), a local organization for special-needs children. Last Sunday, the Gallery was proud to host the opening of its first themed Quadrilateral (geometry-speak for “square”) exhibit showcasing four of our most popular artists along the four walls of our Gallery. Featuring Hilltop community classes art instructors Muriel Timmins, Anne Jehle, Alex Jones and Gallery president Derwent Suthers (large photo, above. Photo credit A. Jones), this unique, first-time show reinforced the quality of our community’s talent. More than 50 guests attended the afternoon reception and enjoyed refreshments served warm with our hospitality. 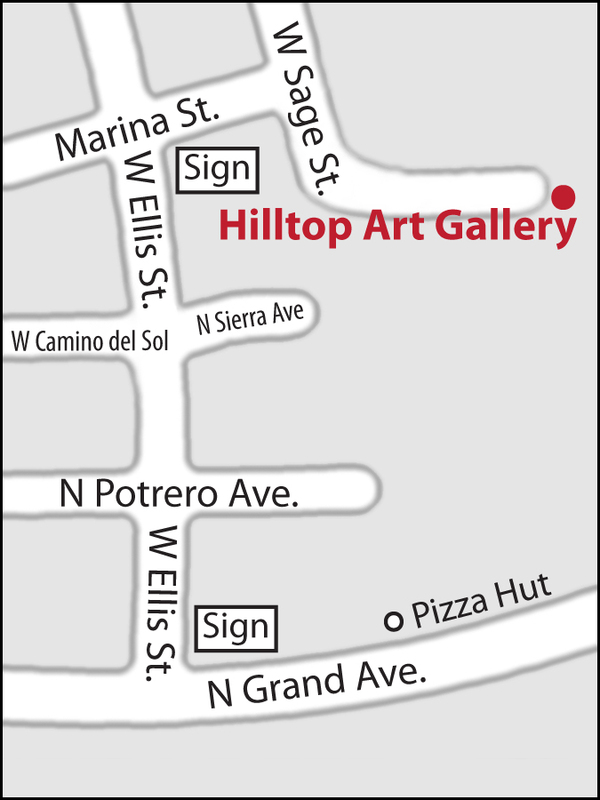 We are pleased to announce that, thanks to the generosity of the Santa Cruz Community Foundation and overall interest from local residents, we are planning to begin Gallery art classes in Rio Rico on February 21. 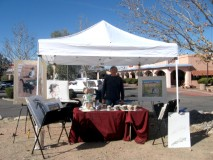 This past weekend we had an outreach booth at the Rio Rico Farmer’s Market, manned by Hilltop Board member, fellow artist and head Gallery instructor, Alex Jones (photo). The goal of this effort was to announce our local arts program. We were pleased with the positive reactions and several actual sign-ups from residents. Our classes are especially geared toward local children but we invite anyone to join us! We are now making final arrangements about the venue for these classes, so please check back here soon or call the Gallery at 520-287-5515 for more information.